Listed in the New Zealand Listener's "Top 50 books for kids 2017"
Here’s a book that really gets how 21st Century Kiwi families work and play. Written by more than 100 early childhood educators across New Zealand, Bright Ideas for Young Minds is the best activity book to be published in a very long time. It’s a big, colourful hardback book full of experiences for parents to share with their child. All the activities (70 of them!) are quick to make, mostly free, and visually interesting. So, for all the time-poor, budget conscious folk out there, (that’s most of us, right?) this is the book for you. None of the activities use screens, ‘junkie stuff’ or chemicals. Furthermore, in many of the book’s activities, the authors make a point of having children engaged in - and proud of - helping out around the home. 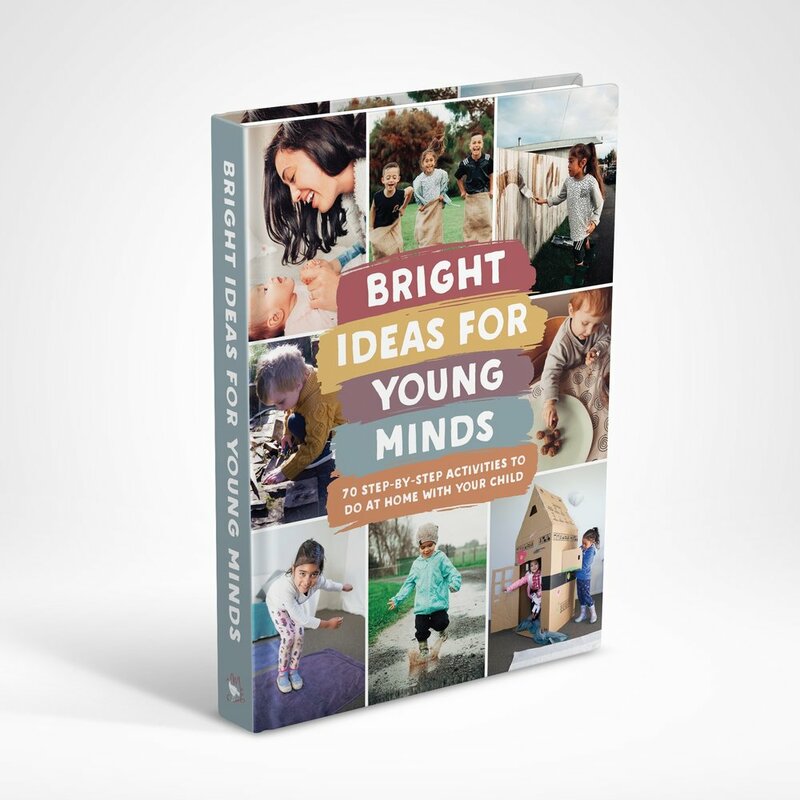 Bright Ideas for Young Minds is the brain child of the team at BestStart, New Zealand’s largest early childhood provider. For the last 21 years, they’ve been at the coal-face, providing high quality care for our wee ones, so they know a thing or two about what children like and what gets those neural pathways engaged. This book is a treasure trove of activities designed to engage, entertain and stimulate even the busiest young minds. It’s divided into seven chapters: Budding Scientists, Little Helpers, Inspired Minds, Outdoor Explorers, Young Artists, Critical Thinkers and Busy Bodies. Each experience and activity has a photo, an easy ingredients list, a description of the activity and interestingly, a summary of what learning is occurring for your child. From Wet and Wild Adventures and Fizzing Chalk, to Giant Ice Balls and Stomp Painting, this book has countless ideas, all beautifully photographed and laid out in an easy-to-follow style. Bright Minds is home grown here in New Zealand. It’s imbued with our environment and culture and speaks to Kiwi families. If you’ve got children, grandchildren, nieces or nephews aged between 0 - 6, this book is a winner. Hardback, 280 x 218mm (Portrait), 184 Pages, full colour throughout. — Professor Richie Poulton, MSc PGDipClPs (Otago) PhD (NSW), FRSNZ. Director of the Dunedin Multidisciplinary Health and Development Research Unit. Bright Ideas for Young Minds is a book that screams for your attention as soon as you lay eyes on it. It’s big, robust and beautifully designed, printed and bound, with fun and exciting content to match. But what is it? It’s an activity book brought to life by New Zealand’s largest early learning provider, BestStart and written by kiwi educators with contributions from Plunket, Heart Foundation NZ and Jumping Beans. BestStart started life in 1996, when Chloe and Wayne Wright became involved in Early Childhood Education. From their first centre in Tauranga employing five staff, today BestStart is the largest provider of Early Childhood Education and Care with over 270 centres and approximately 4,500 permanent staff throughout New Zealand. Children and families matter to BestStart, and its Vision and Values underpin its mission as an organisation – making a positive difference in the lives of children through working in partnership with teachers and parents, enabling children to reach their learning potential. This is supported by BestStart’s values of Commitment, Respect, Enthusiasm, Diversity, Integrity, and Trust. BestStart operates centres across the country with different brand names including Edukids, Topkids, First Steps, Early Years, Community Kindy, Montessori and ABC. BestStart also provides a home-based service to families in Waikato, Bay of Plenty, Northland and Wellington. Every BestStart centre works with a unique community and as such the service has its own centre philosophy that reflects the place and community of the people it serves.